lethally hot water that killed sockeye salmon on the lower Snake River in 2015. A new report released by environmental advocacy group Columbia Riverkeeper suggests that the massive die-off of Snake River sockeye salmon during the exceptionally hot and dry summer of 2015 could have been avoided, if not for the four federal dams on the lower Snake River in eastern Washington. More than 250,000 endangered sockeye died due to a lethal combination of hot weather and low flows that raised water temperatures in the Columbia and Snake rivers. Migrating salmon rely on cold water for survival, and have trouble moving upstream as temperatures reach 68 degrees. Using computer simulations, Columbia Riverkeeper determined that average river temperatures would likely have remained below 68 degrees in the lower Snake River if the four dams -- Ice Harbor, Lower Monumental, Little Goose and Lower Granite -- were not in place. Miles Johnson, clean water attorney for Columbia Riverkeeper and one of the authors on the report, said he hopes it will prompt the Environmental Protection Agency and U.S. Army Corps of Engineers to take a hard look at breaching the dams to keep water temperatures healthy for fish. "Snake River dam removal needs to be on the table," Johnson said. "Because it will work." Last year, a federal judge in Portland rejected the federal government's latest proposal for managing dams in the Columbia Basin. U.S. District Court Judge Michal Simon ruled the plan needs a major overhaul, and that breaching one or more of the lower Snake dams ought to be considered. In its analysis, Columbia Riverkeeper focused on 2015 because, as Johnson said, it shows what could become the new normal for the region given climate change, with the Pacific Northwest trending toward wetter springs and hotter summers. The study, which was released Aug. 14, uses a model known as "RBM-10," developed by the EPA in 2001 to study temperatures of the Columbia and Snake rivers. RBM-10 takes into account a number of different factors, including air temperature and river geometry, to come up with a prediction of water temperature. According to the report, a free-flowing lower Snake River would have remained cooler than 68 degrees throughout most of the summer of 2015. On the other hand, temperatures broke 68 degrees from mid-June until September in most of the dammed lower Snake. Terry Flores, executive director for Northwest RiverPartners, criticized the modeling in the report, which she said is overly simple and one-dimensional. It is especially glaring that the study did not incorporate use of cold water in Brownlee and Dworshak reservoirs to reduce water temperature during the 2015 crisis, she added. "This is hardly a convincing analysis to argue for Snake dam removal, a draconian action given the benefits these dams provide," Flores said. Northwest RiverPartners is an organization that represents farmers, ports, electric utilities and businesses along the Columbia and Snake rivers. 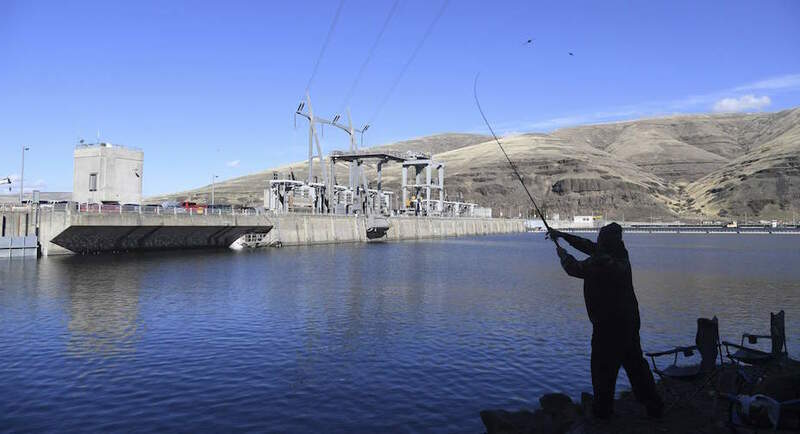 Flores said the study is a thinly disguised attempt to undermine legislation that would keep the current salmon plan in place while agencies work out a new hydro system operations plan. A spokeswoman for the Army Corps of Engineers in Walla Walla declined to comment on the study Monday. The Corps is working along with Bureau of Reclamation and Bonneville Power Administration on an updated environmental impact statement on 14 dams within the interior Columbia Basin, including the lower Snake dams.